Wayne is the previous GM at the famed North Island Resort in the Seychelles and has previously lead teams at Vomo Island Resort in Fiji and Hayman Island on Australia’s Great Barrier Reef. All three properties garnered numerous awards under his leadership, earning him a reputation for creating environments and cultures in which guests’ every need are not just met, but anticipated and exceeded. 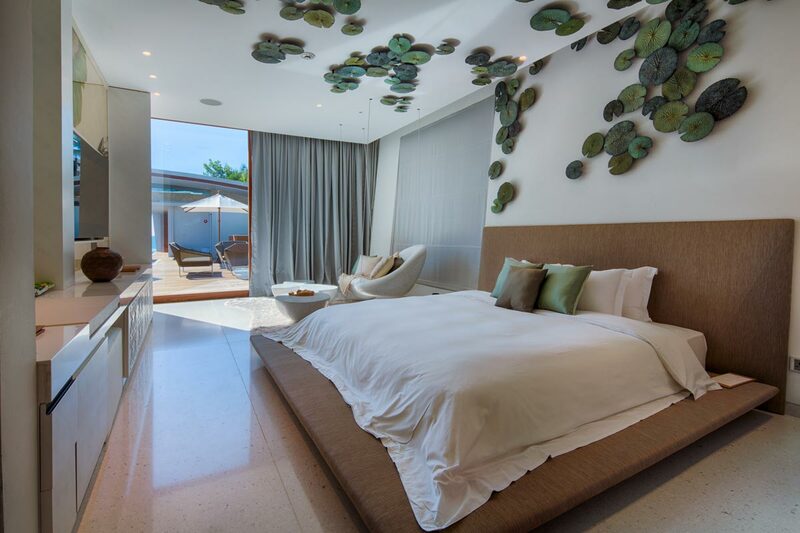 Iniala Beach House has brought a new level of luxury hospitality to the Phuket region with three beautifully appointed villas (each with three suites) and one spectacular penthouse suite. The residence is a masterpiece of design fusing traditional Thai architecture with organic, contemporary forms featuring the work of world-renowned designers. 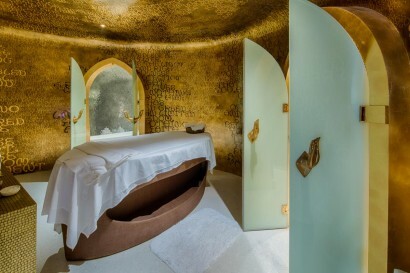 Each villa comes with its own spa and personal therapist, while three star Michelin Chef Eneko Atxa from Spain oversees the on-property restaurant Aziamendi. Mark Weingard wanted to bring innovation and imagination to the luxury travel world. Mark personally travelled the world and chose 10 different designers from Brazil, Spain, Thailand, Russia, the United States, Ireland and the United Kingdom and gave them the brief to create out of the ordinary beautiful spaces. Mark brought together 19 different artists across Thailand and Indonesia to complement the cutting edge designs. Iniala Beach House, the product of this creation, is surely the most visually stunning hotel in Asia. But Design and Art is only half of the story. Mark personally toured Spain visiting 8 renowned restaurants looking for a creative chef to take Iniala to gastronomic heights. Eneko Atxa,the new star of the Basque culinary scene, was chosen and he has created his first restaurant outside of his native country.Mark then identified Sandro Aguilera ,Phukets most popular expatriate chef to create the personalised I dining experience,where there is no menu and the cusine is created around the guest. The final piece of the jigsaw is the “entourage hospitality concept”. 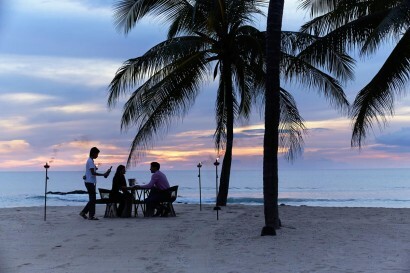 The Villas have their own Villa manager and team of chefs and housekeepers. They also have their own Personal Spa therapist and own private massage space.The guest can have their treatment without reservation and without leaving the paradise of their own accommodation.Each Villa also has its own designated luxury transport and driver. The Philanthropic touch -­‐ 10% of all room revenues go directly to the Inspirasia Foundation to help the disavataged across Asia. • Free Personal Training, yoga and sports activities. 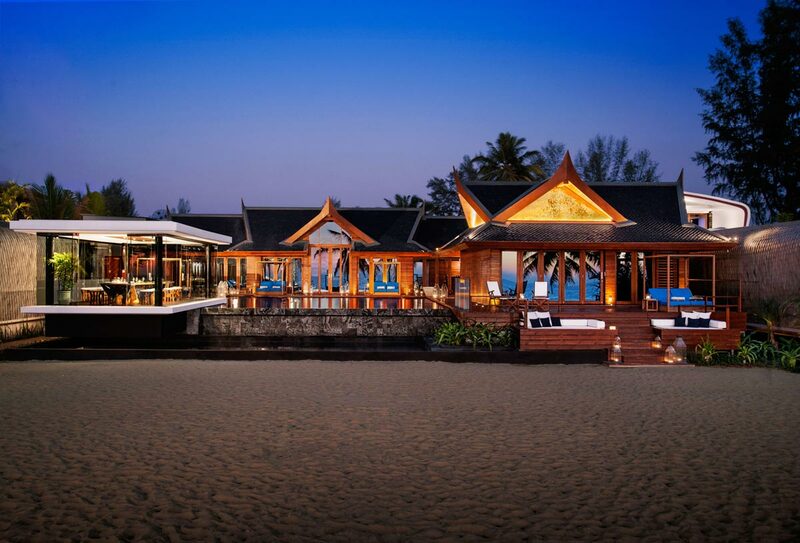 Iniala Beach House is located on the white sands of Natai beach on the Andaman Sea just 20 minutes north of Phuket Airport. The serene countryside that surrounds Iniala is full of temples and villages and makes a perfect route for those who love cycling and walking.. .Iniala makes a great base for watersports including scubadiving and sailing. The highlight is Phang Nga Bay, the most spectacular seascape in Thailand, just a short drive away. Imagine a world full of tree houses and caves, a place where there are costume shops and a theatre. This is the world that our children’s designer Christopher Jones conjured up for the special little ones in your life. There are child carers on hand to look after your child’s every need and the restaurant offers a children’s menu. Your children can even sleep at the Kids club in their very Treehouses and caves . This stunning Penthouse offers exquisite views out to the Andaman Sea The wonderful 250 square metre terrace and the oversized swimming pool make this a real fusion of indoor and outdoor living. The carpet has been specifically created with memory foam beneath and recreates the feeling of walking on sand. The sumptuous ‘White Leather’ bed suspends from the ceiling cradling you whilst you sleep. 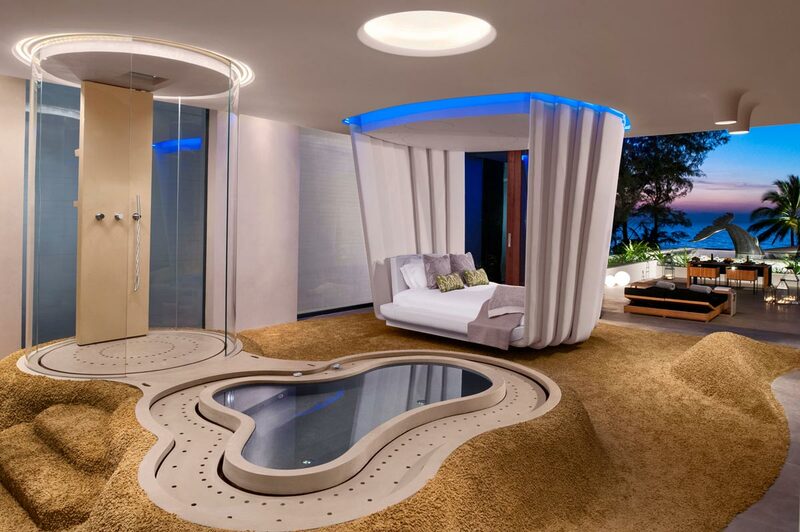 The incredible bathing space features an oversized bathtub. This opulent and spectacular bedroom comes complete with a spacious walk-­‐in wardrobe and its own Kitchen and Bar. Four leading global designers and craftsmen have created a series of wonderfully eclectic spaces housed in a contemporary interpretation of a classic Thai house, The villa boasts a large living room, courtyard, a personal spa and a private cinema. 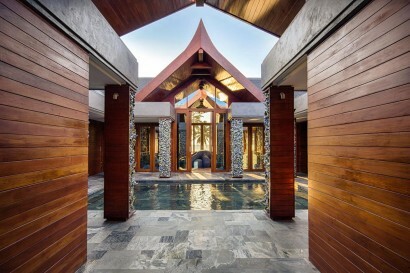 Fashioned from Golden teak with accentuated eaves and beautiful tiles, the architecture brings a contemporary twist on the traditional wooden Thai house. The lavish swimming pool with the beautiful crystal dining room bring grandness to this spectacular abode. 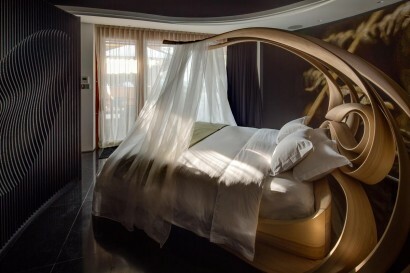 The bedrooms within the Collectors Villa are each as individual and eclectic as the artists who have conceived them. 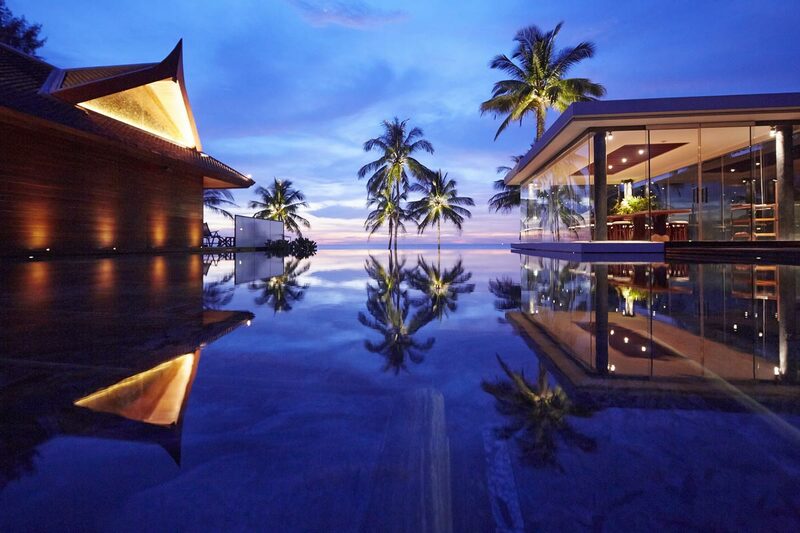 Elegant and sunny from Spain’s Jaime Hayon; a symphony of ash wood and stone from Ireland’s Joseph Walsh; and a daring and sensual boudoir from New Zealand’s Mark Brazier-­‐Jones.The Collector’s Villa is the most luxurious and beautiful three-­‐bedroom villa in Southern Thailand. 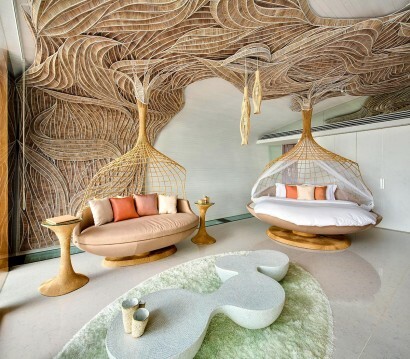 A cero from Spain and PoD from Russia created the interiors for this villa using White furniture and natural wood producing spectacular spaces that act as a wonderful canvas for exquisite Asian art. 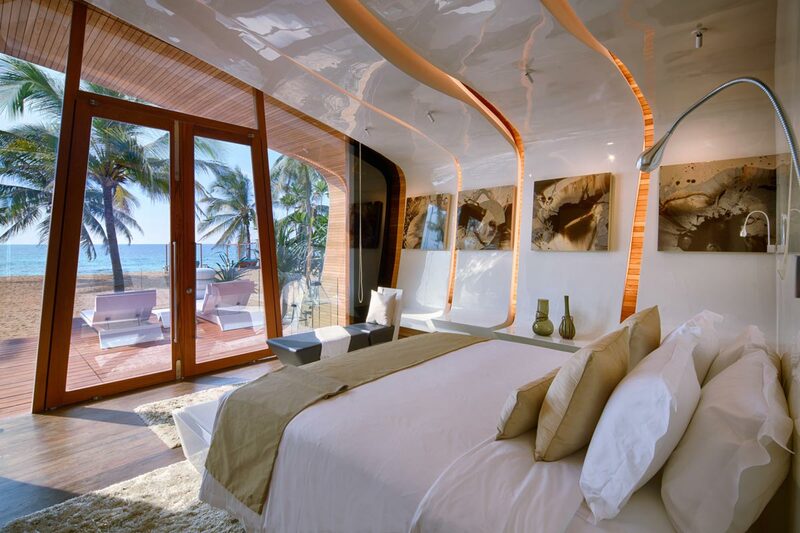 This very private deck has a comfortable dining/living area and 20 metre swimming pool.The magnificent beachfront bedrooms represent giant seashells resulting in wonderful sculptural forms that cling to the spectacular curvaceous ceilings. Indonesian artwork and Thai silks complete the furnishings . 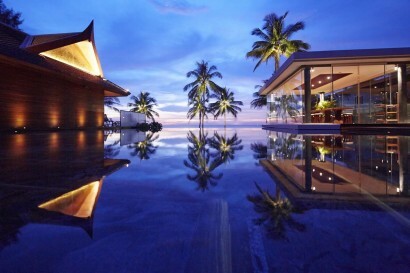 This remarkable villa will awaken your senses and immerse you in a Thai experience like no other. There’s plenty of space to relax or entertain with a large deck complete with a grand dining and living area and refreshing 20-­‐metre swimming pool, perfect for laps The Thai temple bell spa is the highlight of the villa with its Gold leaf walls and sacred Buddhist text engraved into the splendid dome.The two beach suites feature interestingly sculpted beds and sofas that are reminiscent of a temple stupa and silkworm cocoons. • Aziamendi Restaurant, our signature restaurant is headed up by three-­‐star Michelin Chef Eneko Atxa from Spain . 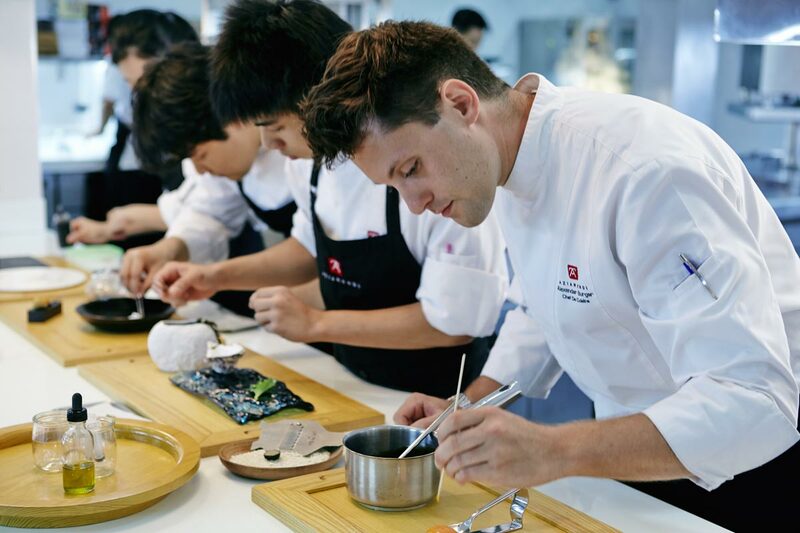 Chef Eneko Atxa hasx created an extraordinary menu using Basque technique fused with Thai ingredients, 6 presenting an entirely new dining concept. • Sandro Aguilera is Iniala Beach House’s head chef, overseeing and designing the culinary programs for each villa. He meets with each and every guest of Iniala, customizing the cuisine for the entire week. Each Villa has its own personal spa therapist and opulent private massage space. Your therapist will give you your massage and beauty treatments whenever you wish without reservation and without leaving the cocoon of your own villa. Whether you want to practice Yoga, Pilates, meditate or sweat it out at a boot camp, Iniala uses the wonderful beach of Natai for most of its personal training. For those who prefer water-­‐sports, Iniala offers, wakeboarding, paddle boarding and other non-­‐motorised sports. Cycling is a joy around the serene countryside surrounding Iniala and is full of exquisite temples, villages and vegetation. Iniala has also a spectacular and well-­‐equipped gym including a Thai boxing ring for those who prefer air conditioned comfort. Whatever way you want to get fit our team of personal trainers headed by ‘Chai‘ will take care of you. ‘Iniala White’ is situated in the Iniala grounds and is a relaxed environment specifically designed for unique functions including; weddings, small concerts, launches, corporate meetings and beach side lunches and destination dining. The ‘white house’ offers ample interior space for brides and their wedding parties to relax and prepare for their special day. Using its dedicated kitchen, events from intimate gatherings to hosting up to 350 guests can be easily catered for.